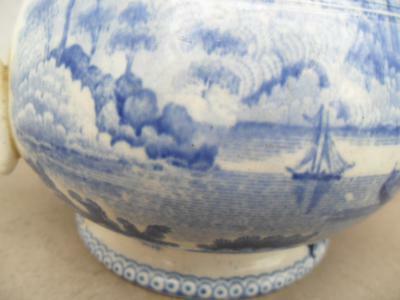 Blue and white transfer print with Oriental scene. There is no marked on it. 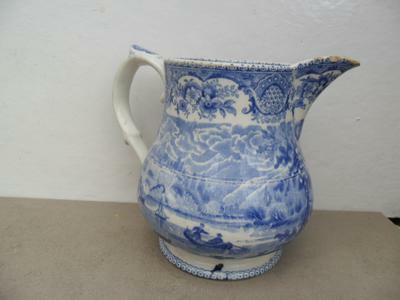 Is it Chinese or European pottery? You say 'pottery'. 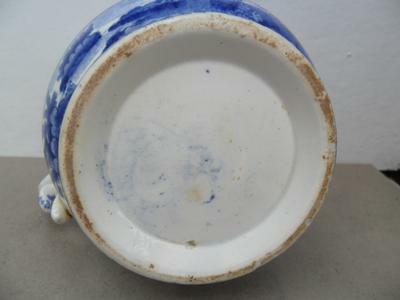 The Chinese simply did not make the porous and brittle white earthenware that the English made in quite huge numbers. The printed designs included quite a few Orientalesque designs, including in colored inks (a sort of deep red, purple, bluish green) in addition to the standard cobalt-blue color. Also many floral and Euro-scenic designs. They usually did have a stamped maker's mark, but the 20th century versions could have had stickers.